MTS Recommends... Why do I have Carryover? Why do I have Carryover? This is a very thorough treatment on why carryover happens and how it can be minimised. It will be a very useful resource if you are experiencing this often infuriating problem. Help on: When Should I Throw my HPLC Column Away? "If the value for the theoretical plates for an HPLC column decreases below 2000, should the column be discarded? And which parameters should be considered when deciding when to discard a column?" "Unfortunately the answer to your question is - it depends. Deciding when to get rid of an HPLC column is difficult and may depend on what the column is being used for and whether it is being used for a single type of method or lots of different methods and samples. The theoretical plate count (N) is a good indication of how well a column is working but it is relative, this means that you need to monitor the value over the course of the column lifetime and correlate the value with the decrease in separating power. If the chromatography for a method looks good and the peaks are still separated adequately for quantitative analysis then I would not discard a column because the value of N went below 2000. However, from experience for a particular column you may know that the method does not work as well once N is below a certain value and thus this could be your indicator that the column should be discarded. It is definitely easier to use this approach if the column has only been used for one type of analysis. Once a column is used for lots of different samples then it is very difficult to predict when it will fail. There are a few things to be aware of if you are using plate number. 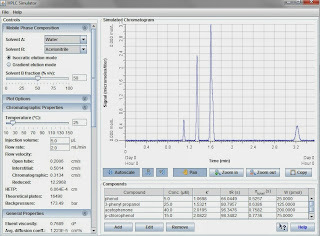 The value is specific to a particular analyte and thus it will be different for each peak in your chromatogram, this can make it tricky to say a column has a particular number. Also, it is only useful if you are using isocratic elution methods, it is not meaningful for gradient methods. Resolution – if the peaks that you are interested in are not separated adequately then the column may need to be discarded, you would expect this to build up over time. A sudden loss of resolution may have a different source. A typical value of resolution when the separation is satisfactory is Rs > 2 although a value of around 1.5 is usually considered baseline separated. Therefore a value < 1.5 indicates that the separation is not adequate. Peak shape – peak tailing (especially on large peaks) is usually associated with the age of the column and at some stage will be too great for reasonable quantitative analysis. A typical value of an acceptable tailing factor is T < 2. Therefore when the tailing factor is above this value the column may be no longer performing at an adequate level. Peak shoulders may also appear (on all peaks) which indicate that there is a build-up on the column inlet that means the column is no longer fit for use. Theoretical plate count, N – in the region of about 2000 is usually accepted as a limit but be careful not to throw away a column that it still working. Pressure – The back pressure of the column will usually build up over time and may determine the lifetime of the column." Is Your Analytical Method Stability Indicating? When setting up a stability programme for a pharmaceutical substance or product, analytical methods are selected to allow appropriate testing at the required time-points. 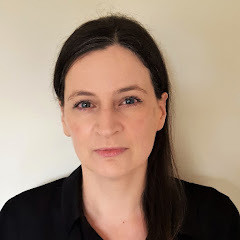 A number of different types of methods may be selected but the quantitative measure of the active pharmaceutical ingredient (API) and its degradation products is probably the most important. Since these methods are being used to interpret the effects of the stability study then it is self evident that they need to be stability indicating but how can you be sure that this is the case? The challenge is to demonstrate that each method is, in the words of ICH Q2(R1), "suitable for its intended use". To demonstrate suitability, and therefore show that your method is stability indicating, you will need to be able to quantify the API and its degradation products so that you can monitor the expected decrease in the amount of the API and the corresponding increase in the amount of degradation products. Therefore, samples of the degradation products will be necessary to show the method is capable. These are usually sourced by applying stress to the samples in a forced degradation study. 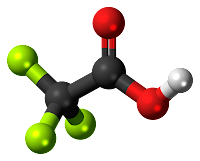 Although the principle is straightforward, this type of investigation can be very problematic and requires a thorough understanding of the chemical properties of the API and predicted degradation products. When carrying out an audit which involves stability testing, I will often ask the question "Is this analytical method stability indicating?" 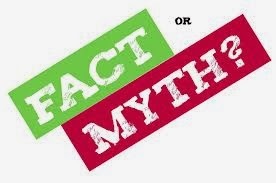 What I expect to see is a section in the validation report which details the evidence that demonstrates that the method is stability indicating. 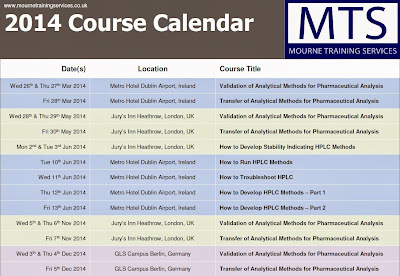 Since the analysis of an API and its degradation products most often requires the use of HPLC, Mourne Training Services has created a training course which focuses on how to develop stability indicating HPLC methods. Strategies for generation of suitable degradation products via forced degradation is combined with a thorough step by step guide to HPLC method development. 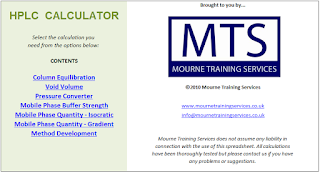 Mourne Training Services has gained a reputation for high quality training solutions through our range of open enrolment training events and also in-house training programmes delivered at customer sites. We would like to draw your attention to other related services that may assist in the pharmaceutical laboratory, namely auditing and consultancy. We can offer laboratory specific auditing which allows a detailed investigation of both compliance with the relevant regulatory standards, and whether a sound scientific approach to analytical chemistry has been applied. 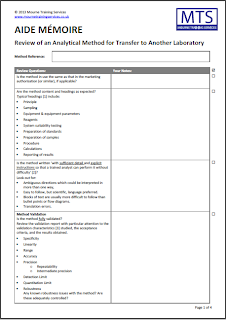 This may be required for an upcoming inspection or simply as an independent assessment of how your laboratory is performing. We can help you to achieve a balance between ticking all the boxes for regulatory compliance and having the understanding of the underlying science which ensures data quality. Our auditing service may be combined with consultancy services to assist in the implementation of the audit outcomes. We will provide practical advice and assistance on how any shortcomings can be corrected. Ultimately a training solution may be identified which we will be happy to advise on, and prepare and deliver if desired. 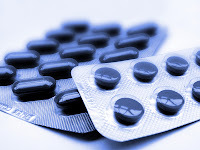 Contact us to discuss your pharmaceutical analysis auditing, consultancy and training needs and we will provide a quality solution at a reasonable cost. This buyer's guide from SelectScience provides a straightforward overview of the different methods of water purification used to produce the water used in laboratories. 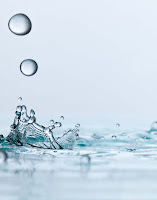 From an HPLC perspective, water is a very common mobile phase component and effective troubleshooting requires an understanding of what could be present in the water being used. I think this guide may be helpful for this purpose. MTS offer very generous discounts for early booking on our training courses. The deadline is coming up very soon for our London courses in April and Berlin courses in May. 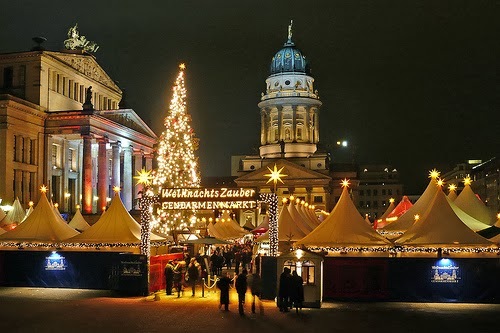 Submit a booking form, or just contact us, to secure our early booking rate by the 22nd March for London, and by the 10th April for Berlin. Click on the course titles above for more information about each course; including a course description, and a booking form containing costs and available discounts. Submit the booking form or contact us by the 18th March to secure our early booking rate. 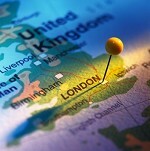 The venue for the training is Jurys Inn Heathrow, convenient for travel by car or public transport. If the dates don't suit you then take a look at our full course calendar for 2013. These courses are also available at our London location in November, and in Berlin (May, June & December) and Dublin (June). 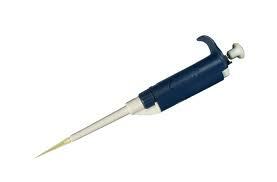 There are quite a few free tools on the web to help you use HPLC effectively. 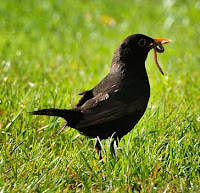 I have chosen seven tools to share with you in this blog that I think should prove useful, in no particular order of preference. Please let me know if there are any others that you think should have been mentioned and I’ll include them in a future blog. 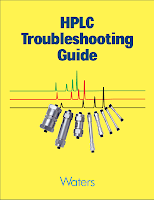 This excellent troubleshooting guide by the late Dr. Neue takes the form of a series of questions and answers, where each topic starts off with a question describing a particular problem and the answer suggests a possible solution. This is then followed up with more information and builds up into a dialogue on each troubleshooting topic. The guide is well written in an easy to understand format and is presented as a pdf where the bookmarks have been carefully set up to allow you to navigate through the document easily and find the topic that relates to your troubleshooting enquiry. Click here to access the guide. 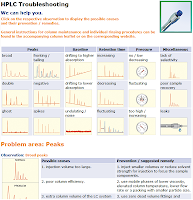 This is a straightforward troubleshooting resource from Macherey-Nagel where you click on your symptom, be it related to chromatography, pressure or a leak, and the webpage will scroll down and present you with a selection of possible reasons for the problem. I think that it is a good resource to prompt a user who has some experience of HPLC about potential sources of typical problems. There is a little bit of product placement in this tool, where Macherey-Nagel products are recommended, but it's fairly minimal. Click here to access the webpage. Many manufacturers provide scaling calculators so that you can makes changes to HPLC method parameters and still retain similar chromatography. 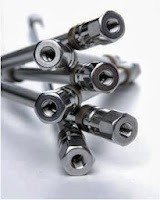 Recently scaling from HPLC to UHPLC and vice versa has become important as the new capabilities of UHPLC are exploited. One of these calculators is from Supelco, it is available online, and also as mobile app for Android and iPhone/iPad. It’s easy to use, you simply input your current method parameters and the change you wish to make to particle size, column length and internal diameter, the tool will provide the new method conditions. It works for isocratic and gradient methods. This useful textbook contains detailed descriptions of the components of liquid chromatography systems, e.g. pumps, detectors, etc., and is likely to be helpful to enhance understanding of these. It also covers silica and bonded phases together with some case studies. Watch out for the time zone on the download day! For those of you who don’t work in the pharmaceutical Industry, USP is ‘United States Pharmacopeia’. The column comparison tool that they offer is free to access and useful to anyone using HPLC, not just those who work with pharmaceuticals. The tool will allow you to find a column that is equivalent to one which you specify, or may also be used to find a column which has different selectivity, something that can be very useful during method development. Click here to start the application and when you have agreed to the disclaimer, click on ‘Compare Columns’. 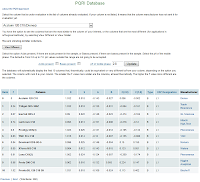 There are two database options, I recommend the bottom one, or PQRI (Product Quality Research Institute) Database. Select the column you are interested in from the drop down menu and, if you know there are acids and bases in your sample, tick the appropriate boxes. You can also specify a pH. There are two other options, either select ‘View Similar’ or ‘View Different’ as required. A full description of the approach and how the database was created can be accessed on the webpage. 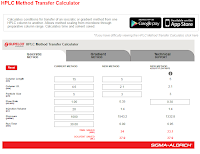 This calculator is available as a mobile app for iPhone™ and iPod touch® but there is also a web version that you can use on your desktop (requires flash). It is designed “to help you quickly determine both flow rate and back pressure under a wide variety of conditions and column dimensions”. I think this tool is great for checking out if a method is viable in terms of the back pressure when I want to change method parameters such as particle size, column length and internal diameter, and flow rate. This allows optimisation of the method without having to check these experimentally. Although the system pressure of your HPLC is not included in the result, it still provides a good starting point. Click here to access the tool, you can select the mobile app or web version. Agilent also provide an article describing the use of the calculator which may be helpful (click here to view). And finally, I couldn’t leave out the HPLC calculator provided by yours truly! This free download includes a range of helpful calculations, none of which you couldn’t do yourself, but intended to be a convenient tool for those with a busy workload. It will help with equilibration times, preparation of mobile phase and using scouting gradients for method development. Click here to access the download page.